Kif and Leela's offspring born. Leela finds out her true origins. 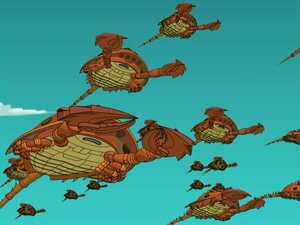 (14th) (Valentine's Day) Bender dates the ship, dumps it, the ship doesn't take the break-up well and almost crashes itself into a quasar. The crew dumps their cargo of candy hearts into the quasar causing a mystical love radiation that spreads across the universe destroying many, many planets, including two gangster planets and a cowboy world. Earth moved further from the sun to combat global warming, making the year one week longer– President Richard Nixon declares it Robot Party Week; Professor Farnsworth presented with the Polluting Medal of Pollution. Earth v. Zoidberg case held. Zoidberg sentenced to death. Decapodians invade Earth, briefly enslave humanity. Old Man Waterfall crushed and killed. Fry finds the fossilized remains of his dog, Seymour. Zapp v. Fry, Bender and Leela case held. The case never reached a verdict. Roboticon 3003 held in New New York; the advanced Robot 1-X model unveiled. This page was last edited on 2 December 2011, at 23:00.